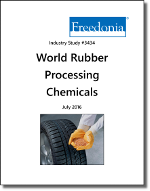 Global demand for rubber processing chemicals is forecast to increase 4.4 percent per year through 2020 to 1.5 million metric tons. Growth will be driven by rising rubber consumption and the increasing rubber processing chemical loadings necessary to manufacture premium tires, high performance automotive and industrial goods, and a range of other products where expectations of quality and long service lives are increasing over time. Advances will be strongest in the developing countries of the Asia/Pacific region, but improving conditions in the mature markets of the US, Western Europe, and Japan will also contribute significantly to growth. Companies mentioned include LANXESS, China Sunsine Chemical, Sinochem, Eastman, and Addivant.